Here is an informative speech sample, on how humor can help people heal themselves. Informative speeches don't always have to be heavy handed and serious but can be written in such a way that teaches as well as entertains. 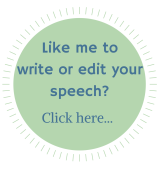 Read this sample for inspiration, then pick a topic that interests you and create your own speech that informs, yet still contains a touch of humor. I had to spend a week or so in the hospital last year. A minor ear infection turned into some major problems for my immune system. I was fairly depressed and frustrated one night after my doctor had given me the news that still more tests would be needed, which meant another few days in an uncomfortable bed with people poking and prodding at me. As I thought about it, the pain began again, and I was sure that my condition might only become more serious. About the time I began to wonder if I would ever see my own home again, my best friend from high school stopped by. She was, quite literally, our class clown. She always had a great joke on the tip of her tongue. She was the mascot at the football games because her antics were so funny. Even now I can't help but smile when I think about her. Two hours after she left, I felt great. I had no pain when I woke up the next morning, and that evening, all of my test results were positive. A miracle? Actually, yes. Study after study has indicated that humor has interesting healing powers. One way that humor can help to heal is that it literally changes our outlook on life. As we laugh, we have trouble seeing life's difficulties the same way. Suddenly, our problems don't seem quite as bad. Humor allows one to distance him/herself from a painful physical or medical situation while also acknowledging that he or she is in such a situation. This change in perspective is a powerful healing force. Distancing yourself from a distressing situation allows you to view certain circumstances from a more objective perspective, and this can help you extract powerful emotions that focus on your pain or sorrow. In doing this, you do not reject the painful circumstances surrounding you, but acknowledge the reality of your situation - the good with the bad. Recent mental health studies have shown that laughter can stimulate areas of the brain that release endorphins, helping us to see our situation more clearly. The benefits of humor, though, aren't all mental. Humor triggers laughter. According to physiological studies, the laughter, in turn, stimulates our cardiovascular systems by increasing the rate at which the heart beats and contracting the muscles. In fact, one study suggested that laughing one hundred times per day is the equivalent of spending ten minutes on a rowing machine. 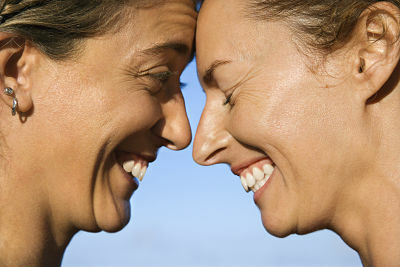 One study went so far as to suggest that the benefits of laughter reach far beyond our body system. "Laughter reduces levels of certain stress hormones which suppress the immune system and increase the number of blood platelets - which can cause obstructions in arteries, and raise blood pressure," said one researcher. "When we're laughing, natural killer cells that destroy cancer cells increase, as does the level of Gamma-interferon - a disease-fighting protein, T-cells - a major part of the immune system, and B-cells - which make disease-destroying antibodies. Laughter may also increase the concentration of salivary immunoglobulin A, which defends against infectious organisms entering through the respiratory tract so it helps us to resist colds and viruses." That makes quite a case of the adage "A barrel of laughs a day keeps the doctor away." The healing power of humor is wide-ranging in scope and situation. Though medically, the interesting healing powers of humor are still being studied by many scientists, humor clearly heals the spirit - a part of every one of us which is often neglected by medicine and science. Seeing the humor in our painful or emotional situations can free us from the chains we have built around ourselves, helping us to recognize that life is more than anger or pain or sorrow, but that it is full of humor and the contagious sound of laughter. Now it's your turn! Grab a pen and paper or your laptop, make yourself a cup of your favorite beverage and write yourself an amazing informative speech to teach, impress and entertain your audience!